Flattened heads of white flowers, opening from rosy-red buds from December to April, followed by dark blue-black fruit. This dependable, evergreen shrub is both faster growing than other varieties and has larger leaves. Flourishing in sun or partial shade, the shiny, dark green foliage provides a dense backdrop against which ornamental plants can easily be seen. Garden care: Remove any over-vigorous shoots that threaten the shape of established specimens in early summer, cutting them well back to within the plant's outline. I am delighted with this plant. I have a north-facing back garden with a lot of shade and one border which was built over a gravel foot path (lots of stones in the soil!). 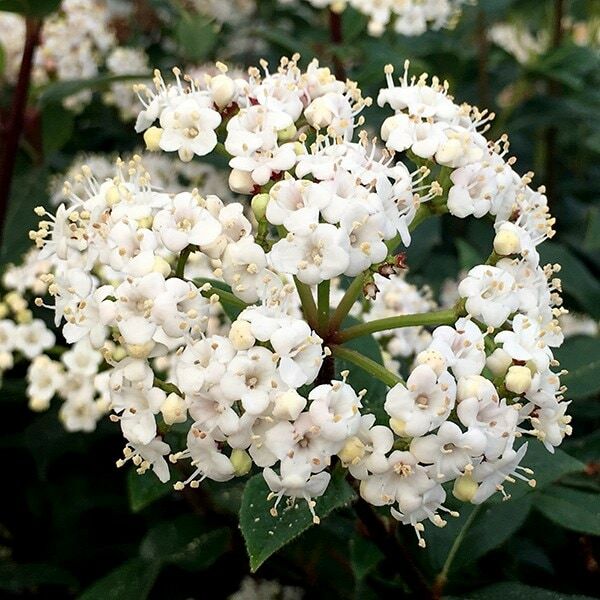 Viburnum Tinus has grown impressively and looks extremely handsome and bushy all year, beautiful flower heads December to March and super-strong stems. It is one of the highlights of my border over winter. Little or no maintenance other than to retain shape. I highly recommend it. 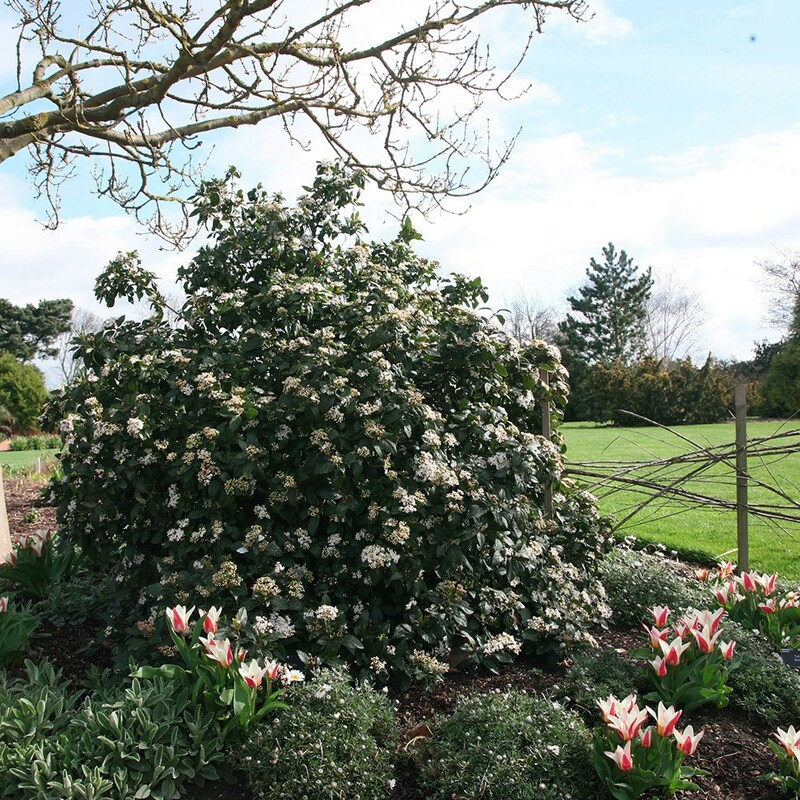 I am thinking of planting a hedge of Viburnum tinus 'French White' to screen our compost bins and utility area. Could you advise me of the best planting distance to create a hedge please, and the best clipping regime to keep it dense and in shape. Thank you. Hello, I would advise planting these at 45cm intervals. As for clipping, they do have a naturally dense habit, so will require little pruning, although they can tolerate being cut back quite hard. If you do feel the need to prune it, then the best time to tackle it is in late winter or early spring - but keep in mind this will have an impact on the amount of flowers it produces. Hello. Please could you clarify the differences between viburnum tinus french white and eves price for me? I am unsure which to choose. I would like an evergreen shrub which will hide an ugly fence and add some winter colour to my garden. Hello there There isn't a vast amount of difference, except that Viburnum tinus 'French White' is faster growing than 'Eve Price', and has white flowers whereas 'Eve Price' has pink buds that open into white flowers. Also I believe the berries on 'Eve Price' are more of a deep metallic-blue. Hope this helps. Ideas for a shrub to go between 2 Cotoneasters please? Dear Crocus Some advice much appreciated please. I have ordered a Berberis darwinii from you to fill a space between 2 Cotoneaster franchetti shrubs that run along a fairly short piece of garden fence. I cut away a gap between the 2 Cotoneasters to break up the uniformity last year, and put some Sedums in as the soil is pretty dry here, but this doesn't look right. It looks a bit like a shrine to me! This part of the garden is west facing so gets the afternoon sunshine, and the soil is clay based but without much depth. I thought the Berberis would be good as it is also evergreen, produces flowers and berries and according to the literature is pretty quick growing, and seems to tolerate most situations and soils. But I have a 4 year old and I'm now a bit concerned re the spiky leaves. So before the Berberis is sent out is there another shrub that you can suggest (ideally evergreen) that would do the job i.e. blend or contrast with the Cotoneasters and make a somewhat less uniform and more interesting block. Thanks for any advice.